Stuffed Tomatoes – Grow. Eat. $ave. Got an over abundance of tomatoes?!? Looking for a cool, light and refreshing side…or even a main dish dinner?!? 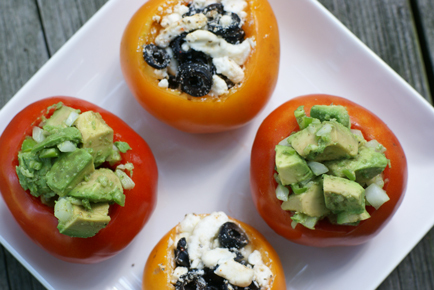 Well, stuffed tomatoes are THE way to go! In a mixing bowl, toss together the avocado, onion, jalapeno, crushed garlic, ground cumin and lemon juice. Season with a little salt and pepper. Stuff the Spicy Avocado Salad into the Tomatoes. Cut a cone around the stem bud of the tomato to cut out the center portion. Scoop out the seeds. In a mixing bowl, toss the black olive slices and the goat cheese and stuff into the awaiting tomatoes. Place the stuffed tomatoes on a hot grill and grill for about 5-8 minutes, or until goat cheese gets oozy…and the tomato skin begins to wrinkle. 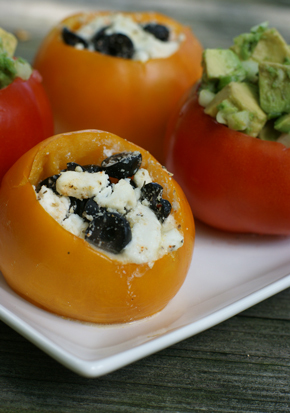 Do you have a favorite filling for Stuffed Tomatoes?! We belong to a CSA and the tomatoes aren’t even in full swing yet & we are getting close to 10 lbs per week! I have been making tomato basil salad, bruschetta, and this week i made homemade tomato sauce. I have about 2 lbs of tomatoes on my windowsill ripening as we speak, and I am looking forward to dicing them up & canning them for use in soups & sauces through out the winter, because there are only so many days of fresh tomatoes I can handle before I am ready to start dropping care packages off by the basketful to unsuspecting family & neighbors! I’m hoping to be able to can tomatoes this year. We’ll see if I get around to it. The fresh tomato soup recipe I’m linking up is from last year, but oh my word, it is SO tasty! Oh yeah, I’m drooling. I’m canning more salsa with the excess tomatoes this week but I’ll have more in just a few days and then I think that the black olives and goat cheese one sounds to die for! I get a lot of cherry tomatoes too – even though I only planted one cherry tomato plant. One! And I’m still getting 10+ a day. I like to make couscous with roasted garlic and olive oil, then pan cook the cherry tomatoes cut into 8th’s, along with onion and zucchini. Mix this all together and then stuff in a cored tomato and serve with your favorite crackers. We sometimes have mac and cheese with this as well. My mom used to make this when I was little on hot evenings and I loved it. My children are now teens and adults and they all love it too. @Paula, Your tuna salad sounds incredible! A cold plate dinner would be a great way to use up all of the “cold” leftovers that accumulate through out the week. Thanks for sharing this idea; I think my kids will enjoy the novelty! I just love tomatoes and I love stuffing them too! I just did a Tuna Curry Salad Stuffed Tomato as well as the Tomato Gorgonzola Bake. The tomato is just so versatile! Roast tomatoes on the grill (need green or slightly under-ripe tomatoes). Roasted red pepper & tomato Gouda soup. Salsa (I lost 20 pounds on a “salsa diet” but it wasn’t exactly “pure” salsa). This post made hungry now for tomatoes so now I’m eating yellow pear tomatoes. I was just thinking about having a tomato salad for lunch. Yummy. I’m so very jealous of your tomatoes. I’ve had exactly 3 ripe tomatoes and 2 of those were rotten on the bottom. I’m not sure what we’re doing wrong with our tomato plants. The cherry ones are doing pretty good though. I’m still holding out hope that our plants will perk up and produce! I love to stuff tomatoes with couscous and some minced onion, peppers, garlic and whatever herbs I have. Sometimes I put some cheese in it and on top and stick it under the broiler for a few minutes. I just love tomatoes. Especially this time of year! I love the avocados in the tomatoes. That is some combination, filled with flavor. Looking forward to trying the pancakes, I have lots of blueberries!